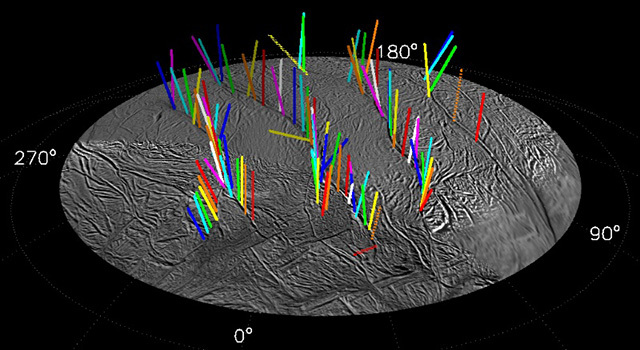 Scientists using mission data from NASA's Cassini spacecraft have identified 101 distinct geysers erupting on Saturn's icy moon Enceladus. Their analysis suggests it is possible for liquid water to reach from the moon's underground sea all the way to its surface. Over a period of almost seven years, Cassini's cameras surveyed the south polar terrain of the small moon, a unique geological basin renowned for its four prominent "tiger stripe" fractures and the geysers of tiny icy particles and water vapor first sighted there nearly 10 years ago. The result of the survey is a map of 101 geysers, each erupting from one of the tiger stripe fractures, and the discovery that individual geysers are coincident with small hot spots. These relationships pointed the way to the geysers' origin. After the first sighting of the geysers in 2005, scientists suspected that repeated flexing of Enceladus by Saturn's tides as the moon orbits the planet had something to do with their behavior. One suggestion included the back-and-forth rubbing of opposing walls of the fractures generating frictional heat that turned ice into geyser-forming vapor and liquid. To determine the surface locations of the geysers, researchers employed the same process of triangulation used historically to survey geological features on Earth, such as mountains. When the researchers compared the geysers' locations with low-resolution maps of thermal emission, it became apparent the greatest geyser activity coincided with the greatest thermal radiation. Comparisons between the geysers and tidal stresses revealed similar connections. However, these correlations alone were insufficient to answer the question, "What produces what?" 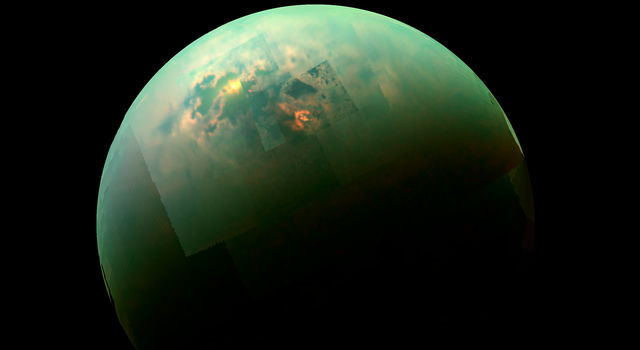 The answer to this mystery came from comparison of the survey results with high-resolution data collected in 2010 by Cassini's heat-sensing instruments. 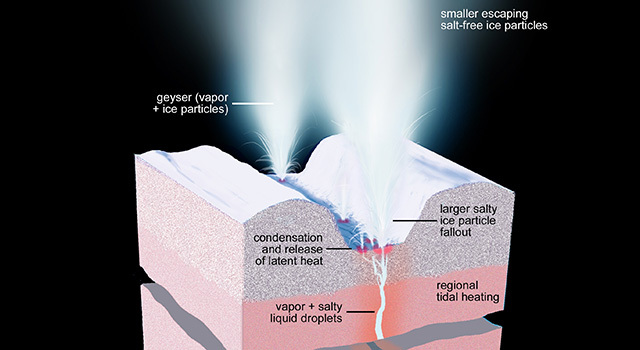 Individual geysers were found to coincide with small-scale hot spots, only a few dozen feet (or tens of meters) across, which were too small to be produced by frictional heating, but the right size to be the result of condensation of vapor on the near-surface walls of the fractures. 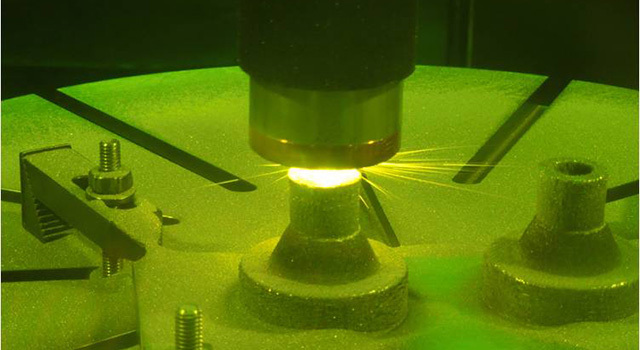 This immediately implicated the hot spots as the signature of the geysering process. 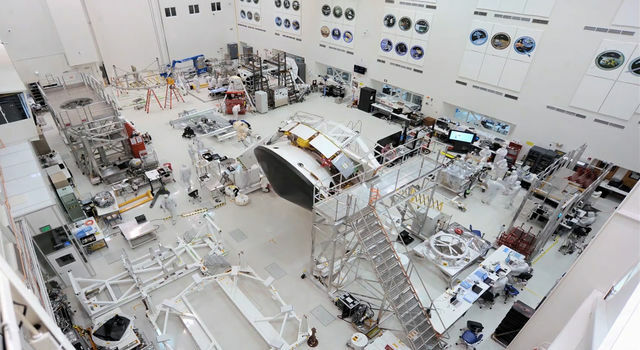 "Once we had these results in hand, we knew right away heat was not causing the geysers, but vice versa," said Carolyn Porco, leader of the Cassini imaging team from the Space Science Institute in Boulder, Colorado, and lead author of the first paper. 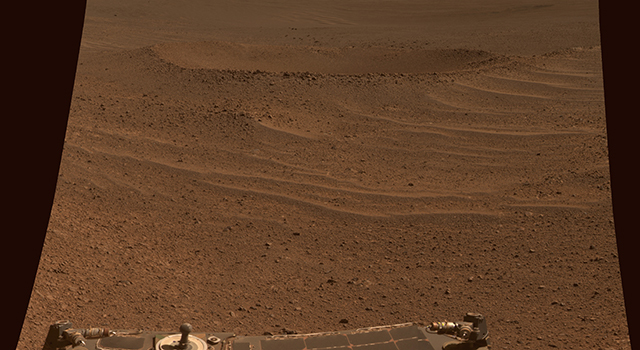 "It also told us the geysers are not a near-surface phenomenon, but have much deeper roots." 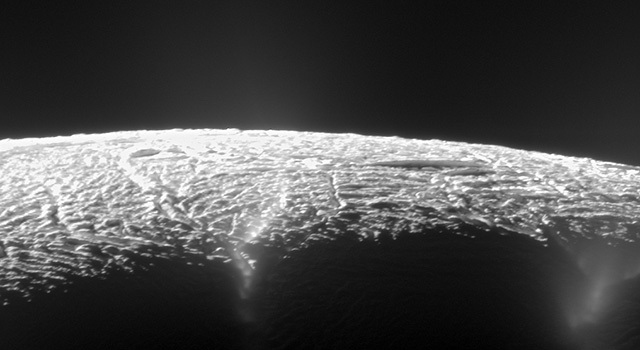 In the companion paper, the authors report the brightness of the plume formed by all the geysers, as seen with Cassini's high-resolution cameras, changes periodically as Enceladus orbits Saturn. Armed with the conclusion that the opening and closing of the fractures modulates the venting, the authors compared the observations with the expected venting schedule due to tides.